Tobias Luthe of ETH PLUS speaks as invited keynote at the Austrian Climate Day 2018 hosted by the University of Salzburg. As one of four keynotes in total, Tobias will elaborate on the relevance of normative goals of sustainable development in building resilience to climate change. 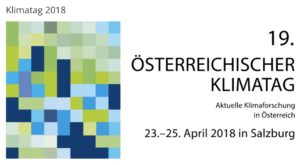 The conference is organized by the Climate Change Centre Austria in partnership with the University of Salzburg, the Federal State of Salzburg, die Austrian Ministry for Sustainability and Tourism, the Alpine Convention and BOKU Vienna.